Why choose Galvanized Steel Gutters? Steel gutters are a popular choice for homeowners because they are very durable and they are one of the most cost-effective gutter choices. The most popular steel gutter types are galvanized steel gutters, as they are the most economical, with their price ranging from $4 to $8 per linear foot installed. Steel gutters are not expensive. Not only is steel affordable, but it is an investment in the future of your home, as steel prices have remained stable for several decades. Steel is extremely durable. If you live in a tornado or hurricane-prone climate, then steel gutters would be the best choice for you. In fact, steel is stronger than aluminum. 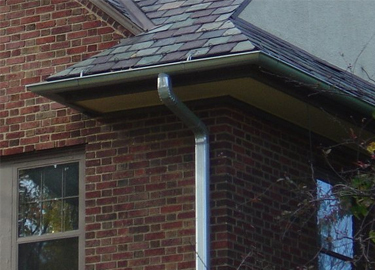 Most steel gutters are formulated with a special finish to prevent rusting. 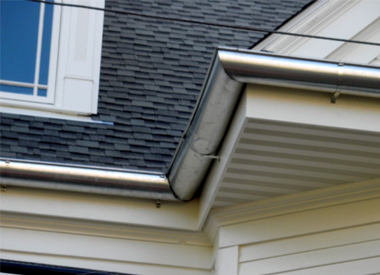 There are also painted steel gutter products that come with warranties. 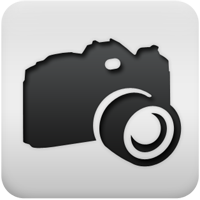 It is a very durable material that will not rust or corrode under normal use. It can be painted in a range of colors that allows for color coordination with the roofs other design requirements. Steel warps less than other gutter types because it is significantly less affected by thermal changes. For example, a 40-foot-long section of an aluminum gutter can be expected to move .62" due to temperature change of 100 degrees Fahrenheit, while steel would move only half that amount. Galvanized gutters are stronger and more durable than aluminum or vinyl gutters. They are available in 10' and 20' lengths in both K Style and Half Round profiles. Half Round Galvanized gutters have been around for decades because of their strength and corrosion resistance. 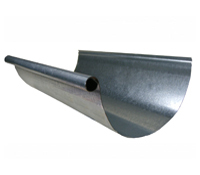 Heavy gauge steel hot dipped with zinc gives the gutter both added strength and superior resistance to the elements.